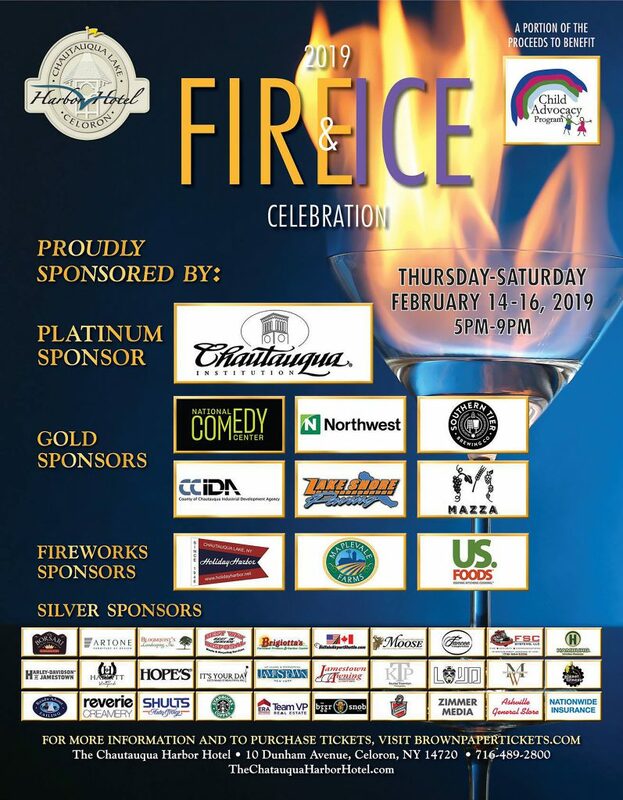 Celeron, NY – ERA Team VP Real Estate and Vacation Rentals is proud to serve as a Silver Sponsor for the 2019 Fire and Ice Celebration at the Chautauqua Harbor Hotel taking place February 14-16. This ticketed mid-winter celebration has a weekend packed with indoor and outdoor activities. Local restaurants, breweries, and wineries will be featured in the Pier Ballroom offering complimentary tastings. Outdoors will showcase over 25,000 pounds of ice intricately carved into sculptures, martini luges, and bars. Each evening will close out with a firework display featuring Chautauqua Lake as the backdrop. As a charity event, a portion of the 2019 Fire and Ice Celebration proceeds will be donated to the Child Advocacy Program of Chautauqua County. Admission for this event is $25, and drink tickets are purchased separately. To purchase tickets, visit brownpapertickets.com. For more information on the 2019 Fire and Ice Celebration, visit TheChautauquaHarborHotel.com or check out the event on Facebook. For more information about ERA Team VP Real Estate  and Vacation Rentals  and the real estate/vacation rental  market in the Southern Tier of Western New York and Northwestern Pennsylvania visit  www.erateamvp.com  or call  their main office at 716.413.0200.